This beautiful new book is a history of Teddy’s dramatic evolution, from his first creation in 1902 to becoming a valuable collectible, and his present work-of-art status. You’ve come a long way, Teddy, and the author brings a unique concept of the last 100+ years of Teddy’s past to his present. I was pleased to add this volume to my library of teddy bear books, owing to Kathy Martin’s exceptional view of Teddy’s progression from traditional childhood toy to his modern day, broad variety of characteristics. This is the author’s first book, but not her last. As a lifetime bruin owner, teddy bear collector, and creator of original teds, I have always preferred a more traditional appearance of teddy bears. Kathy Martin has opened my eyes to a new appreciation for modern bruins, designed and created by talented, imaginative teddy bear artists at the forefront of innovation in modern teddy bear creation. Though teddy bear metamorphosis is the theme, I found good history, information, and facts new to me as I read the chapters. I enjoyed the author’s shared knowledge and evident familiarity with all subjects in the volume. There are chapters on teddy bears used in advertising and as symbols of various causes; bears with more than one purpose; truly colourful teddies; bears in costumes; bears worth their weight in gold; an interesting section on bears in literature; and much more, all written of with style and expertise. The pictures, from many sources, are attractive, with handsome presentations. All the images are in colour, except for reproductions of some very old photographs. It is always of interest to see pictures of teddies which have not been in other books, though some of the lovely photographs are of bears which are famous and familiar. The volume has an appealing cover, primarily in shades of blue featuring a large picture of an artist bear. Three smaller inset photos of other bears are stacked alongside him, to give a pictorial hint of the book’s content on the front cover. 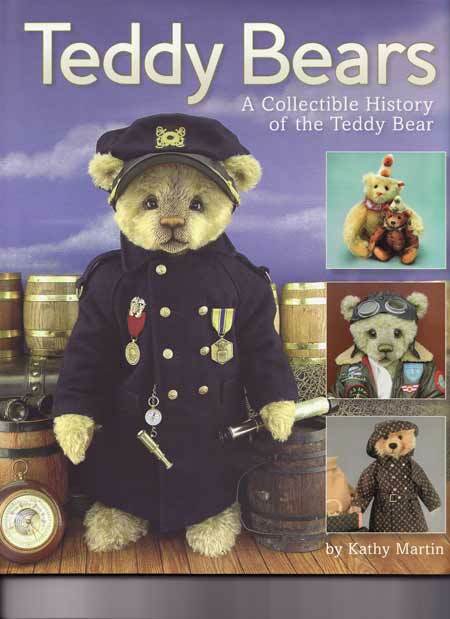 This brand new, up to date book will be a welcome addition to any teddy bear book collection, and a great gift for those with little knowledge of teddy bear history who would like to know more. Lovely to look at, enjoyable to read, a treasure to own, and destined for classic teddy bear book status.